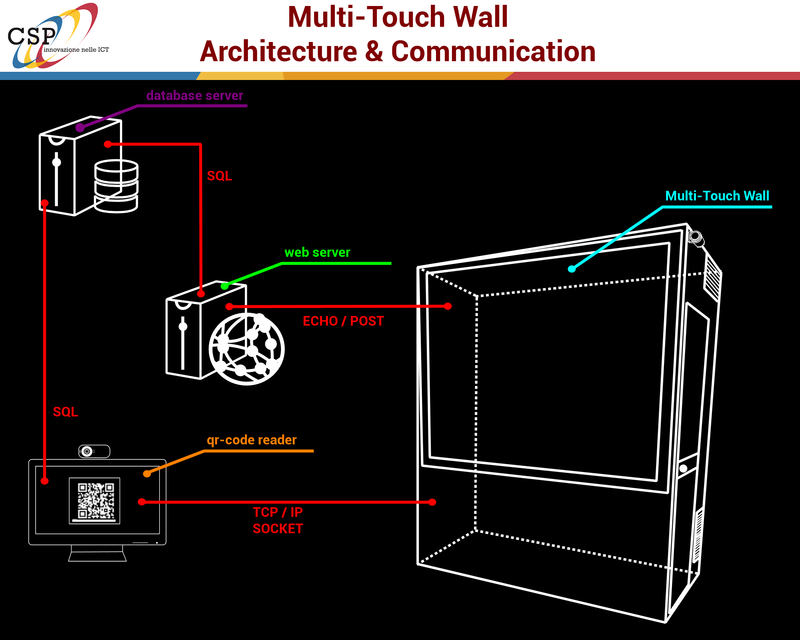 The Touch Wall is part of a diffuse project including tool for qualitative and quantitative analyzing of human motion aimed at maximum interaction between the subject and the tool of analysis, with specificities related to the low invasiveness and the marginal presence of the operator. A subject who uses the Touch Wall interacts with a evolved touch-screen interface capable, through a series of games specially developed, to analyze the motor ability of the subject and give feedback on various motor parameters that are analyzed during the execution of the games. The games are a playful excuse to avoid the commonly used standardized tests for motor analysis and allow the subject to deal with the system in the most natural way as possible. The Touch Wall is therefore able to provide a quantitative analysis of motor skills in healthy subjects using a vertical multi-touch interface equipped with specific software. The need to provide reliable data related to measurement of quality parameters. Using a non-invasive approach in the analysis of healthy subjects. Possibility of obtaining a cross-sectional analysis of multiple parameters simultaneously. Possibility to monitor the change in motor skills over time. Possibility to compare the measurements before and after trauma or in temporary pathological condition. Provide a method to evaluate quantitatively and automatically some motor skills. Provide a method of playful and non-invasive analysis. Provide a reference to comparing people with different characteristics such as age, gender, motor and intellectual skills and normalize them in order to provide a certification of the motor skills characteristics of each people. Provide a tool for screening and monitoring over time with the aim of stimulating the attention on motor skills care before the deficits due to trauma or a disease. The system is designed not only to allow the user to play games but also to store all the results and compare them with those obtained during successive test sessions. To make this possible, it is necessary that the system recognizes the user, creates a dedicated page that contains all the results and updates it at each session. To make this as simple as possible, the recognition system has been programmed to recognize a qr-code generated during user registration. Once the qr-code is recognized, the system unlocks the application on the Multi-Touch Wall and prepares the database to receive the test results that the user is about to produce. At the end of each test, the application will send, through a web server, the results to the database that will save the data to make them available for any future considerations. At the end of the exercise session, the application will query the web server in order to get the overall results from the database and display them on the screen. 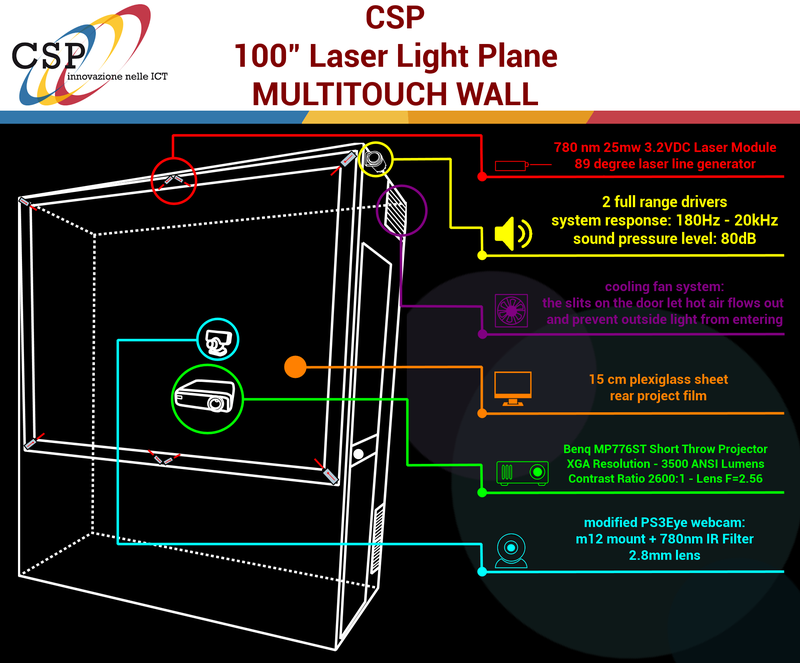 A Multi-Touch Wall is a quite large surface that employs any technology (Laser Light Plane in this case) that allows to recognize the presence of two or more contact points with that surface. In this project it has been used the same open source hardware, already tested in the Multi-Touch table  experience, trying to recreate in a panel of large dimensions and placed in a vertical position, the same ease of use and the great naturalness of interaction we had reached with the previous Multi-Touch panel. The software, specifically developed for this Multi-Touch Wall is called SmartWall. SmartWall is an applications container, used to measure motor skills. There are 9 different tests, each exercise is preceded by directions that explain how to take the test. Before each test you will see a countdown that will allow you to prepare yourself. The tests must be performed in numerical order and when the previous one is finished, the menu help you select the next one. The calibration step is used to know other user data that the application will use to calibrate the maximum space of movement and some other details. Will be asked first to enter the height, then the weight (to calculate the body mass index), and finally it will be asked to draw, on screen, the widest possible circle extending completely the arms. After the system has collected this data, it will be able to calculate the user interaction area in order to correctly configure the following tests. The purpose of this test is to to wipe the objects that will appear on the screen by touching them following the instructions that will be provided such as touching the objects of any color as quickly as possible, or the objects of just one color. The results this test provides are the percentage of correct touches for the right side and for the left side, the number of correct touches, the errors, the left and right range of motion, the fastest touch, the slowest touch and the average response time. Finally will be calculated the left-most, the right-most and highest touch. In this test, it will be prompted to order the numbers from 1 to 35 as fast as possible. The boxes containing the numbers will be displayed in a scattered way, and you have to touch them sequentially to order them. The test calculates the percentage of completion of the exercise, the elapsed time, the number of errors, the side on which the user was faster to find the sequence, the faster and the slower touch and the average response time. In this exercise, it is required to gaze a spot at the center of the touch surface and tap anywhere when you’ll see a white cue ball from a random direction. The application returns as result the time elapsed between the appearance of the cue ball and the detection of the touch, ie the area of peripheral vision. There will also be calculated errors as wrong touches. In this test, the system will play sounds at different frequencies and from different directions. The user has to tap the right button depending on the source of the sound as quickly as possible. 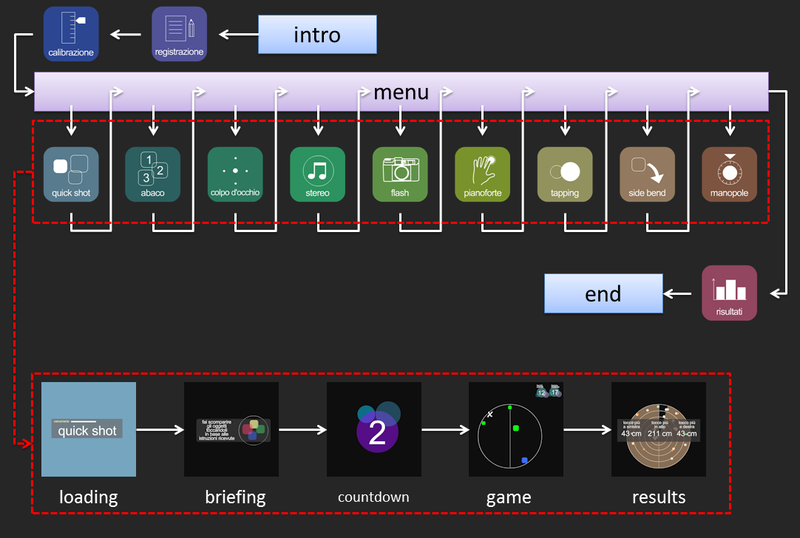 At the end of the game, the results will show the reaction time to the sound grouped by frequency and direction of playback. A camera will take a series of flashes of different colors. The user has to touch the screen if he’ll see the color written in the instructions. The system will count the number of errors and the reaction speed as faster touch, slower touch and average speed of the touch. The test will show two shapes on which the user will have to put his own hands with fingers raised. The system will display some colored dots on the fingers’ shape and the user has to touch them as quickly as possible with the correct finger. The test will count the number of right touches on each hand, the number of errors and the percentage of correct touches on both hands and on each finger. The test will show a series of visual sequences. The user has to store these sequences and play them back. This is not a speed game, so the user will have to repeat the sequence slowly. The system will store the errors and the results obtained in each sequence. The user, in this test, will be faced with a yellow circle at the top of the screen. He will have to place both hands on this colorful circle and then drag it in the direction indicated by the instructions bending his waist on left or right side. The system calculates the maximum deflection angle for the left and the right side. The test will display an on-screen knob. The user has to place all five fingers of one hand at time on the knob and turn it in the direction indicated by the instructions holding his arm outstretched and without turning his shoulder. The results will show the angle of left and right rotation of both hands. The results page will display a summary of the results obtained throughout the test showing an overall assessment of all the exercises.